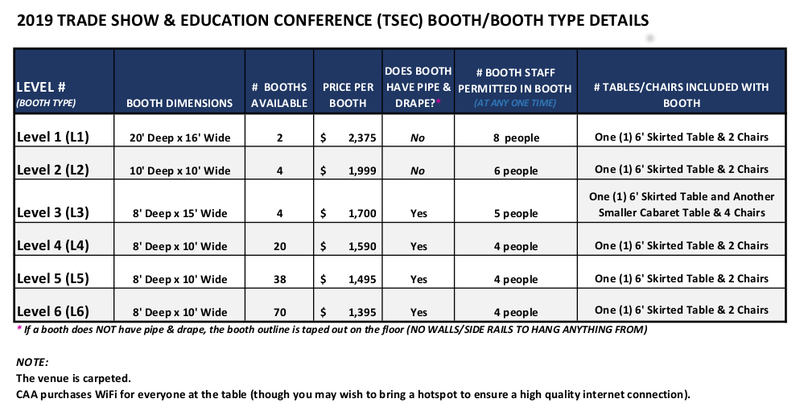 the 2019 trade show & education Conference (TSEC) will be held on Tuesday, April 9th. The trade show will be held on Tuesday, April 9th. Exhibitor move-in and move-out take place on the same day. Exhibitor Move-In: 7:00 a.m. - 10:00 a.m.
Show Floor Hours: 10:00 a.m. - 3:00 p.m.
Exhibitor Move-Out: 3:00 p.m. - 4:00 p.m.
CAA is no longer able to secure room blocks at nearby hotels for out-of-town exhibitors (due to our inability to fill room blocks in past years). However, two hotels (see below) are located within walking distance (one on each "side" of Drury Lane's parking lot). All companies MUST be paid 2019 associate/supplier members of CAA in order to participate. 2019 CAA associate member dues are $750 (plus an additional $50 for new member companies). NOT A MEMBER OF CAA & INTERESTED IN JOINING? ALREADY A MEMBER OF CAA? A Certificate of Insurance (COI) that meets ALL of the requirements listed below is REQUIRED from all of our exhibitor companies, and is due to Lisa Henning (via email at lisa@caapts.org) by Friday, March 22nd. Click here to view a sample COI. Can't remember if you exhibited in the 2018 show or what your booth number was? Click here to view all of the 2018 exhibitor company names (& their 2018 booth numbers) in this document pulled from the 2018 TSEC Show Guide.